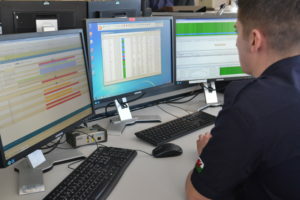 A member of staff from North Wales Fire and Rescue Service Control using the new system. North Wales Fire and Rescue Service has launched a new command and control system, which equips the service with the highest standard of emergency response software to help keep local communities safe. The project takes on a new approach to integration by not only combining systems such as the Incident Recording System (IRS), mobile data and telephony but also systems such as the service’s records management (Farynor) and a corporate gazetteer. In addition, there is a new remote access viewer, Cadview, and the introduction of the Gartan Availabiltiy application and Direct Electronic Incident Transfer. This all represents a major investment for the service and it has already started to pay dividends. 3tc was awarded the contract to provide this new mobilising system for the service in May 2016, following a formal tendering process. 3tc is a provider of software applications to the UK public sector and global emergency services markets. Its focus is on working towards more effective emergency response. On 21 March 2017 and on schedule North Wales Fire and Rescue Service’s Control Room launched Guardian Command, a software designed to help control room staff carry out their duties more effectively. The focus of the software is to give control room operators the flexibility to perform their duties with the minimum of steps. Peter Davis, Head of Control at North Wales Fire and Rescue Service, said, “Guardian Command uses Geode, address matching, which enables control room staff to identify locations faster and more accurately. Geode searches as you type, providing a continuously updated list of possible matches, allowing our operators to stop when they have a match. Geode doesn’t rely on the operator getting particular bits of the address correct and doesn’t need address elements to go in the right field, resulting in a highly efficient and successful search process. “The windows-based system has resulted in improvements in areas such as batch mobilisation, automatic incident creation, incident creation directly from the map and significant improvements to general searching across the system. In addition, Guardian Command is mapped to national incident types creating a more refined approach to data collection and reporting. The supplier was also required to provide a new retained availability system to replace the outgoing application. 3tc therefore also provides, in partnership with Gartan, the applications Availability and Roster. Gartan Availability works with 26 other fire and rescue services; however this is the very first time it has been used to interface with Guardian Command. North Wales Fire and Rescue Service Staff is already noticing marked improvements since the new equipment was launched, with increased user friendliness, ease of access for retained fire crews, and the availability of support and information tools quoted as some of the major benefits. On top of this, appropriate training and familiarisation has been key to the success of the new system, with a team of trainers visiting fire stations across the region in the run up to the launch. The new system from 3tc will now provide the service a solid modern base to complement the introduction of national projects such as ESN and ONAT as well as meeting the ever changing challenges more locally.